Grid Parity: When Will Solar Cost The Same as Electricity From The Grid? 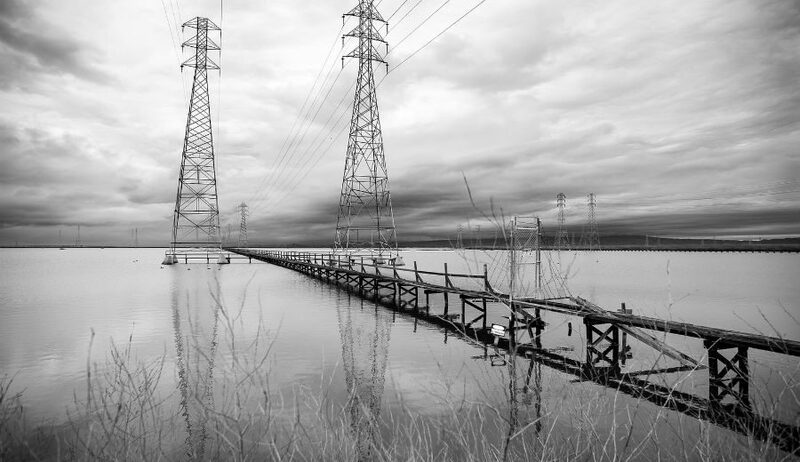 Why is grid parity the key to stopping climate change? What is solar singularity? With all the talk of how much cheaper solar has become in the last few years, is solar about to hit grid parity? If you were to walk into an automotive showroom and there stood two vehicles, a Lamborghini and a Ford Taurus, you’d recognize that both vehicles would serve your transportation needs equally well but one is probably preferable even though it is well above your budget. What if the salesman said that they were exactly the same price? Then which would you choose? Of course you would go with the Lamborghini. Now, take that same scenario and consider, what if you could power your home with solar without it costing any more to turn it on than it does to turn on regular electric service? That is the crux of how grid parity works. When the cost of solar power matches the cost of grid power, grid parity is achieved. When that happens, solar power becomes the norm, not the exception, and everyone happily turns to the better option. Moving toward grid parity is important, not just for the U.S. but for the entire world. We are staring at many serious direct and indirect effects of our planet’s rising temperature and climactic changes. These changes are directly related to our use of fossil fuels. It is undeniable that our climate has been changing at a faster pace than we ever expected. To best understand grid parity, one has to recognize that while many things contribute to the cost of any technology, one thing is almost always true. There is a cyclic pattern in which more interest spurs more manufacturing, more manufacturing spurs lower prices, and lower prices in turn then spurs more interest. If this cycle continues to repeat itself, eventually we reach a point where the cost of a solar power system is equal to or lower than using other energy sources. That is one contributor to how we can reach grid parity. All other things being equal, prices drop as production increases. Richard Swanson, the founder of SunPower, coined the term “Swanson’s Law” which states that every time production and sales are doubled, the cost drops 20%. It stands to reason then that if we can increase the demand for solar panels that eventually grid parity can be achieved. The question in many minds is; when will solar cost the same as electricity from the grid; in other words, be at what is called “grid parity”? The idea is that once solar hits this ultimate test of affordability, it will begin to displace utility electricity. Well, your mileage may vary, but in many states, we are there now. In Some States, Rooftop Solar is Already at Grid Parity! A single month of rented solar already costs less than a single month of rented utility electricity in many states. Here’s how to understand how it works. The standard model for how we receive electricity is that we “rent” electricity from our electric utilities. We don’t own the coal plant or the nuclear plant supplying our electricity now. We simply rent the electricity that the power plant generates. Until recently, renting electricity from our utility was the only option. But then laws were changed and a few states allowed solar companies to come in and compete with your utility. So in many states now, of course, you can simply opt instead to rent solar electricity – made on your own roof – instead of renting the power from the electric company, and in that case you have no upfront investment at all. In this situation, solar is already at “grid parity” in every state that allows solar companies to come in and compete directly with electric companies to rent you electricity from an array of solar panels that they site on your own roof. So for everyone who just wants to look at the short-term,; next month’s bills. We can already compare apples to apples. Solar to coal. Solar to natural gas. Choose to continue to rent electricity from your utility on month by month basis, or instead to opt for a month by month payment to rent solar. When the choice is rent coal power or rent natural gas power or rent solar, renting solar power is already cheaper. But there is one thing to understand about the grid parity question. Are We Talking Wholesale or Retail Grid Parity? Prices have come down a lot. 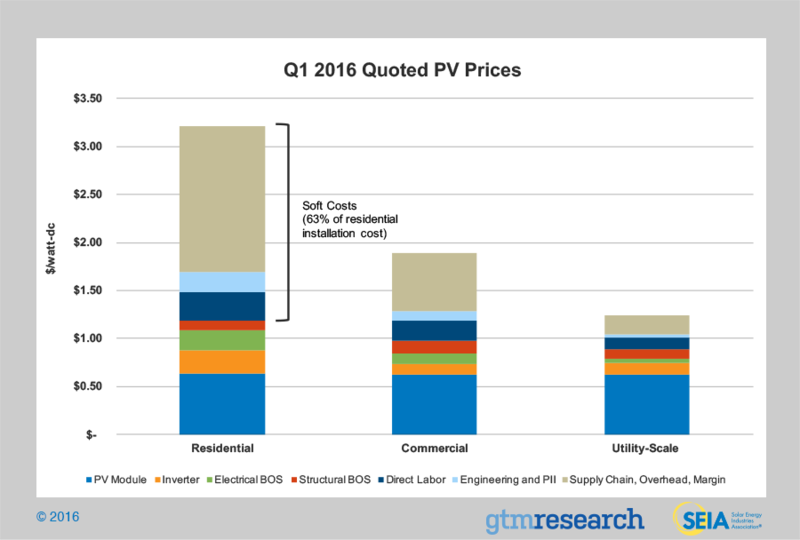 Solar prices in 2016 are 12% lower than 2015, according to the SEIA. But to understand the question, we need to also understand the difference between wholesale and retail electricity rates. Are we talking wholesale grid parity or retail? Just as any business buys at wholesale prices and sells at retail prices, (which is frequently twice the wholesale price) so too do electric utilities buy electricity from power plants at wholesale prices and then sell that power at retail to their customers. Since rooftop solar potentially replaces the retail rate you pay to your utility for the power it buys at wholesale – grid parity for rooftop solar is simply parity with the prevailing retail price (your only option as a retail customer of your utility). Retail electricity rates in 2016 range from 4 cents per kilowatt-hour to 30 cents per kilowatt-hour depending on where you live. But how does that compare to wholesale prices? Current 2016 wholesale rates for all kinds of electric power resources are between 3 cents and 15 cents per kilowatt-hour, depending on the resource and the age of the power plants supplying the power, as well as on market rules. Power that a utility buys from a newer peaker plant can even be as high as 21 cents per kilowatt-hour, based on prices for the new Carlsbad peaker plant in California. But even these wholesale prices are not on a level playing field. An old coal power plant that has been paid off forty years ago can now sell its power for a few cents per kilowatt-hour. A new coal plant would have to sell much higher. Some solar companies are now able to generate and sell solar power at utility-scale for as little as 3 cents per kilowatt hour in some regions of the US. FirstSolar, Sunpower and several others have achieved this – but that is usually with very large-scale solar plants of 100 – 550 MW. Efficiencies of scale make that possible. Topaz for example took 9 million solar panels. Putting 9 million solar panels in an uninhabited desert as one straightforward construction job, after permitting the project as one job in one place, and having negotiated one sales agreement with one utility at one price, and financing it at one banking entity at one time. Once all that’s done, all 9 million of those panels can be installed. It is obviously going to take a lot more work and take a lot more sales time when you are only putting 20 panels on one customer’s rooftop at a time, and then you need to start the sale and permitting and construction process again from scratch, and do it millions of times to install 9 million panels like FirstSolar’s Topaz project. So this is why retail rates for rooftop solar are higher than wholesale solar prices. The “soft costs” make that much more expensive. That is why “soft costs” now constitute nearly all of what causes solar prices to be higher for retail installations than for wholesale installations. But if you were to try to sell 9 million solar panels at retail, you would need to make sales to millions and millions of potential rooftop customers, 15 to 20 panels at a time. This is why wholesale solar prices are lower than retail. Solar is one of the few electricity resources that can be sold either at retail or at wholesale. Small hydro and small wind turbines are typically much less efficient than utility-scale. But you can’t put a nuclear plant or a coal power station in your backyard. While wholesale solar now ranges both slightly above and below market prices of other resources, retail solar also ranges both above and below retail prices from natural gas, coal, nuclear wind and hydro power. But that is the average. Prices vary quite a bit from state to state. One reason prices vary is sunshine hours – “insolation” levels. It is cheaper to go solar in Arizona with 6.5 average hours of sun daily than in Alaska with only 4 hours a day, simply because this creates such a difference in how many hours each day the panels will be working, generating power. The result is that you can make the same power with with a smaller solar system in Arizona than in Alaska. And smaller means cheaper. Another reason prices vary by state is that these nationwide averages include states that are only just now beginning to go solar and to develop an industry of solar installers. Over half the cost of going solar is not the module price the solar company pays at wholesale, but is the cost of “soft costs” of getting customers. Many companies, especially in markets where nobody has gone solar yet, try the door-to-door approach which is costly and labor intensive. And the engineering and permitting and onsite installation labor costs too. That is why, in states only just starting to go solar, in these states solar can cost more because companies are springing up more recently. *Full price before rebates and the 30% off Investment Tax Credit (ITC). Five years later, California prices are much lower. After the 30% ITC, a 4 kW system in California is closer to $10,000 in 2016. So there is a definite downward price trajectory in markets where solar is already becoming more mainstream. The third reason grid parity varies by state is that the incentives vary so much by state. California has 208 different energy incentives. Wyoming has only 20. All 51 states get the big one though, the 30% ITC. Given all the variables cited above, you can see why there is no one answer to the question of when solar has hit grid parity. Because for everyone that is different. Obviously, when you go solar, you’ll no longer pay your utility for all the electricity that you rent from them now. So, you need to know how much you will save on those bills and factor that into the equation of when that tipping point occurs in your case. But grid parity is not a “one price fits all” equation. Electricity is much cheaper in some states than it is in others, so solar is really going to benefit you most if you live in a state with high prices for electricity and tax breaks for going solar and good insolation. Whether you are among the many lucky ones will only be discovered in consulting with a solar installer in your area who knows all the incentives and rebates that are available to you in addition to the 30% ITC. All solar companies do estimates for free. The concept of solar singularity is similar to grid parity, but on a larger scale. While you will have accepted that solar power is the way to go when it is the same cost to you as other power sources, when that happens everywhere across the board and solar power is so inexpensive that it becomes the default power source completely, then solar singularity has been reached. That is where we need to get to. We don’t have time to wait, as we are seeing huge results from this onslaught to our atmosphere. To stop this undesirable outcome, it is important that grid parity and solar singularity happen sooner rather than later. • Phase 1 – Residential grid-connected PV systems: easy to reach as this compares the price of PV to residential power. The 2nd and 3rd phases compare the price of PV to commercial electricity prices, making these phases more difficult to reach. How Close Are We to the Grid Parity Phases in the US? The good news is that many states are already operating at grid parity. Due to the higher energy costs in states such as California, New York and others, it was easier to reach a point where the cost for solar power could come in under those costs. 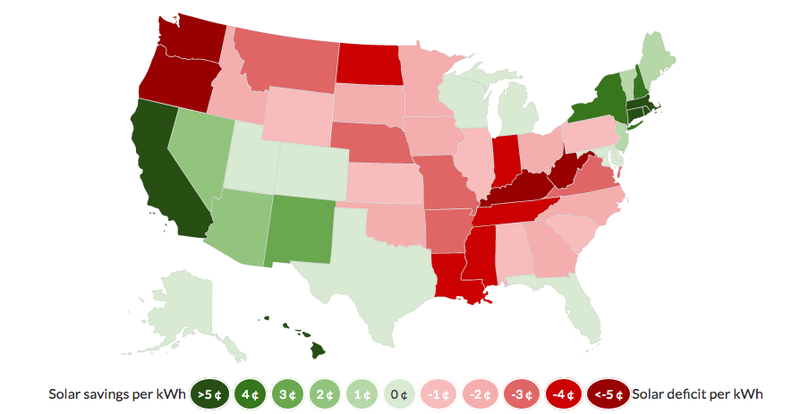 The Interactive Grid Parity Map for Solar Energy shows those states that are enjoying solar savings or at least at solar break-even. 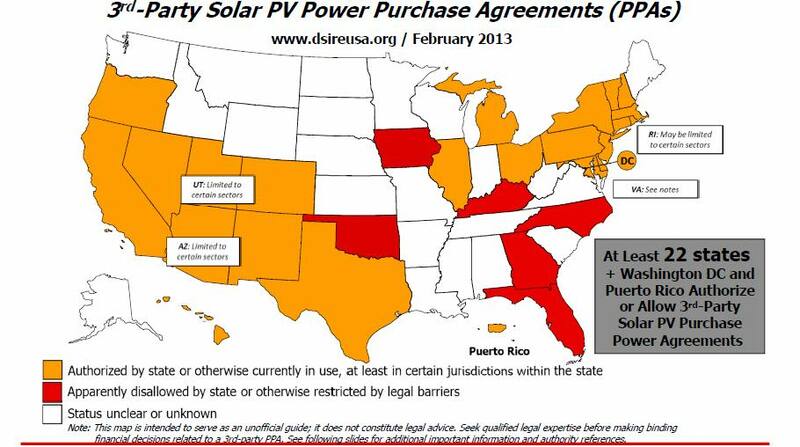 Once the red states follow, our nation will have reached grid parity as a whole. We are clearly working hard, particularly at both Phase 1 and Phase 3, but with some advances in Phase 2 as well. There are some commercial applications moving forward, such as the 15-acre solar array that provides about 18% of the power for Florida Gulf Coast University (FGCU) in Southwest Florida. In the case of general power generation, a number of utility companies are embracing and ramping up efforts to use solar power. For example, Florida Power & Light (FPL), the largest utility firm in Florida, continues to invest in solar energy farms. They have three solar energy farms already producing and have plans for three more, quite probably before the end of 2016. We have a lot going for us here in the United States when it comes to utilizing solar energy. For one thing, we have quite a bit of vital solar power for PV production available, with only a few isolated areas as an exception. If you are curious, go to this interactive mapping tool showing average annual DNI, GHI and other solar resources. Note: GHI stands for Global Horizontal Irradiation which is used to calculated PV power production, and DNI stands for Direct Normal Irradiation, a parameter for concentrated PV. Note where Germany is on the map. You’ll see the entire country has less GHI than any single location in the United States. You would think that would put them out of the running to be able to reach grid parity, but you would be wrong. They are quickly leaving the old ways behind and embracing solar. The adoption of solar has sky-rocketed and they are well on their way to reaching their annual capacity targets and having PV contribute significantly to their power supply. Many reports indicate that they have reached grid parity, along with Italy and Spain. The average end customer price for installed rooftop systems in Germany continues to drop as it is throughout the world. In addition, Germany not only encourages investments but sets requirements. 3. Innovation by decreasing feed-in-tariffs. Fast forward 15 years and we can see the results. Today they have much higher residential grid electricity prices which in turn has made solar power much more attractive. Reaching grid parity is vital to the US, so it makes sense to look at the German model to see how it could be incorporated into our own path to grid parity. With the right combination of incentives, laws and remunerations, along with our better GHI levels, we could easily see even better and quicker results. When we reach grid parity through a balance of higher alternatives and reduced costs of production for solar products, we all gain and so does the planet and future generations. We have a can-do attitude, and that means that if Germany can do it, so can we.